You are currently browsing the tag archive for the ‘Word of Mouse blog’ tag. “Do you never imagine things different from what they really are?” asked Anne wide-eyed. Let the Australian-Canadian cultural exchange begin! Oh, I am sorry. I am speaking out of turn. Let me explain. Last month my blogger colleague Stacey over at the excellent Word of Mouse Books proposed that we each review literature from our respective countries of residence. She announced the two titles that I was to review and I in turn sent her a copy of Foley Russel and that Poor Girl by Rebecca Bloomer, as well as the lovely Snugglepot and Cuddlepie by May Gibbs. So today I am reviewing the first of the two books that Stacey posted from Canada for my reading pleasure. I strongly urge you folks to check out her blog and add it to your roll if you have a site of your own. 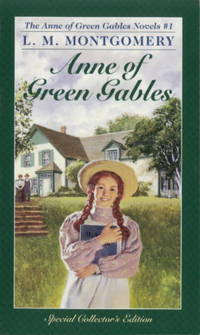 An elderly brother and sister, Marilla and Matthew Cuthbert, manage the farm at Green Gables, hidden from the road that runs through the village of Avonlea behind a line of trees. The years are beginning to take their toll on the quietly spoken Matthew, so the decision is made to adopt a child old enough to work the land, but young enough to be raised with the values of the Cuthberts. However, when Matthew returns to Green Gables he is accompanied not by a strapping young lad ready to be put to work in the fields, but a talkative and precocious girl named Anne Shirley. Despite the mix-up Matthew stubbornly insists that they keep the girl, recognizing in her a kindred spirit despite the one of them speaking not a word most days and the other barely stopping to breath between sentences. Anne’s sweet natured curiosity about the world takes a little longer to charm the sterner Cuthbert Marilla. Anne’s innocence is combined dangerously with a quick wit. She notices the contradictions in people’s behaviour, the hypocrisies of small town worthies. Unschooled in conventions, she speaks out in such way that Marilla is initially mortified by this seemingly hell-bent red-haired orphan. Slowly, but surely though, she learns to appreciate her young ward’s perspective on the world and even begins to catch herself smiling when Anne points out the local reverend seems uninterested in his own sermons, or that the school-master enjoys mocking his students more than teaching them. I’m so glad we live in a world where there are Octobers. Such statements may make one suspicious that this character is little more than a Pollyanna, but I quickly came to love Anne myself. Her desperation to stay at Green Gables, when the Cuthberts are debating whether they should send her back to the children’s asylum; her wild enthusiasm for nature and books; and the easy friendships she makes courtesy of the infectious joy she displays in everything she does. Three primary relationships define Anne’s life. Her mentoring under the increasingly affectionate gaze of Marilla; her passionate friendship with Diana Barry (whom she refers to as her ‘bosom friend’); and finally there is her intense rivalry with Gilbert Blythe, who earns her eternal enmity (or at least until they graduate) by insulting her on her first day at school. I love Anne’s habit of conversing in long monologues, much to the bewilderment of her friends and neighbours. I love how the overall tone of the book is one of wry goodness. This is an unforgettable Canadian classic. Fantastically enjoyable.